Legion Everlasting Gratitude Wreath Program had the community out in force on Saturday morning, December 2 at Arlington and Smith Cemeteries. Members of the following organizations provided support: Field-Allen Post and Unit (ALA) 148, Studio Flora personnel, Kiwanis, Rotary and Boy Scout Troop 805 all contributed to the cause. The above organizations and the public descended upon Arlington Cemetery at 9 a.m. to attach bows to the wreaths and then place them on over 300 Veteran’s Graves. 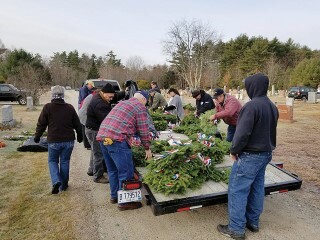 At the same time, the cadre from the Windham High School Cadet Corp was busy placing 200 wreaths on the veterans’ graves at Smith Cemetery on Route 202. Over 850 wreaths have been placed on veteran’s graves in three days at all the Windham cemeteries. Members of VFW Post 10643 provided coverage to the cemeteries in the northern half of the town and Legion Field-Allen Post members placed wreaths on cemeteries on River, Highland Cliff, Chute, and Nash Roads in the southern part of town. The Everlasting Gratitude Wreath Program originally started by Libby Jordon of Studio Flora is now organized by the Field-Allen Post with support from Studio Flora. Plans are already underway to continue the Wreath Program for 2018.